nevard_090214_lyne_tornado_DSC_3605_web, originally uploaded by nevardmedia. I've never seen so many people out for a steam special ever in all my years of snapping train - which is about 30 years. Maybe the end of steam in 1968 bought out more people? No. 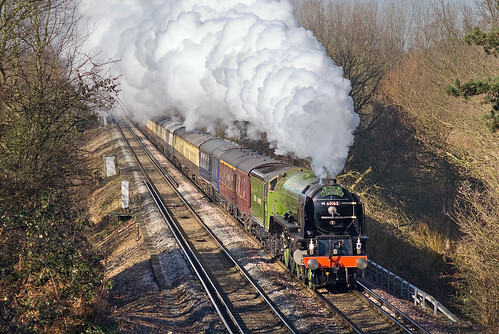 60163 'Tornado', the A1 Steam Locomotive Trust's brand new steam locomotive, is captured here blasting up the grade at Lyne near Virginia Water with Steam Dreams 'Valentine's Day Special' circular tour from Waterloo Victoria on a beautiful crisp Saturday 14 February 2009. Nikon D200, Nikkor 85mm f2 Ais. 1/800 @ f4. 100 iso captured in RAW. 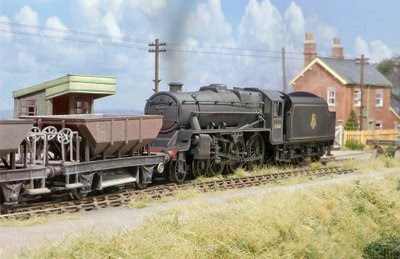 Bath Green Park's 45440 propels a short rake of Dogfish ballast hoppers into the siding at Catcott in preparation for engineering work at the weekend. To try to give the water in the drain that runs along the front of Catcott Burtle that more static look of an old canal, a dash of paint here and there has been applied to give the effect of water lilys. Pictures of the old Glastonbury Canal, drains and nearby rhynes show these little green floating platforms favoured by sunbathing toads (well, in childrens' stories anyway) to be prolific on the Somerset Levels. 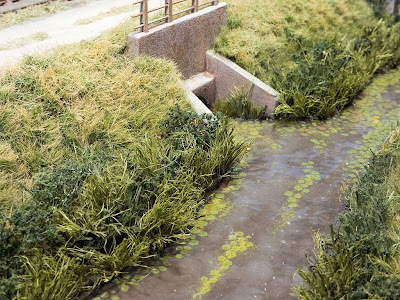 To achieve the effect here, first the canal bed was painted a greyish brown colour (any old paint will do). Next, 2 layers of PVA white glue, then when set the lilys were painted on with acrylic using 3 different shades. To finish off, the whole lot was given a thin layer of clear gloss varnish. nevard_090201_catcott_20168_IMG_3838_web, originally uploaded by nevardmedia. The obese generation - do they treat their 'hobbies' the same? 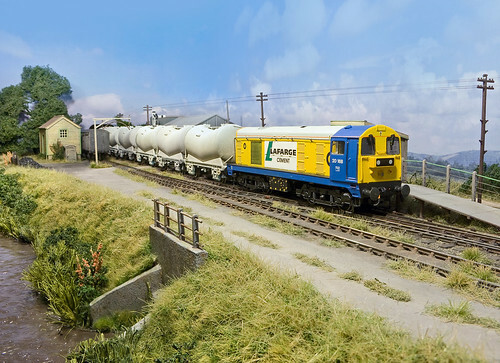 On RM Web there's a thread running which is querying the cost of ready to run items from a well known British model railway manufacturer. It sadly very much reflects in my opinion they way the hobby has evolved in recent times, with people not wanting to make anything, but acting simply like that spoilt, greedy, obese child on Christmas day. All they want to do is buy, buy, buy and have one of everything - I thought the hobby was about making things, not a stock buying marathon? Then, they moan that it is an expensive hobby! This hobby can be a very cheap one if we take an old fashioned creative approach - you know, the unfashionable one which means it might not happen immediatly because we have to make it without 'F' functions, a mouse and a keyboard - and heaven forbid no CRTL Z if you mess it up! Trains are however only a tiny part of the railway scene, buildings and lineside details etc, can with some easily learnt skills and patience be built for pennies. The most important bit is imagination and creativity - and hey, guess what - that bit's free! 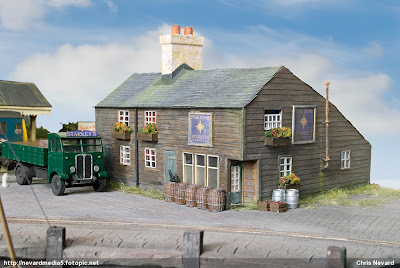 Something which from Scaledale or such which may cost £20-30 can frequently be scratchbuilt built for well under a fiver using plastic sheet, cardboard and such. I have nothing against this new bread of 'ready to run buildings', they do have their place (I have plans to incorporate one into a new project), but increasingly people forget that they're not the only option in this 'I want it now pay later' society. The old pub here was made entirely from junkmail leaflets, cornflake packets etc. The planking was printer paper, the stove pipe is a length of plastic sprue from an old kit and the chimney pots from rolled up paper. I did splash out on some micro strip for the windows, though to be honest self adhesive paper labels stuck onto some clear packaging would be just as effective - if not better. Total cost? A guess about £2.00! Oh yes, research was free, that was from the local history section of the local library! OK, back to the all important trains; as for the cost of modern RTR, in real terms they're a fraction of the cost of what would have been similar items 20 or 30 years ago. We should stick some of these moaners into a time machine and send them back in time, they'd soon really have something to moan about with the then low quality (compared to now) and high price which was the downside of pre Chinese manufacturing. They'd probably have to 'save up' their money too, for in those super high interest days, credit cards were only for the idle rich and business users who'd pay them off fully at the end of the month.